The table above is drawn from United Nations projections. It probably underestimates Iran's predicament: the UN's "low variant" puts the country's total fertility rate at 1.9 children as of 2015, but it already has fallen to just 1.6. This means in simple arithmetic that a generation hence, there will be two elderly dependents for every three workers, compared to 7 elderly dependents for every 93 workers today. That is a death sentence for a poor country, and at this point it is virtually irreversible. Iran's low fertility rate has produced a rapidly aging population, according to a new U.N. report. The rate has declined from 2.2 births per woman in 2000 to 1.6 in 2012. This has pushed the median age of Iranians to 27.1 years in 2010, up from 20.8 years in 2000. The median age could reach 40 years by 2030, according to the U.N. Population Division. An elderly and dependent population may heavily tax Iran's public health infrastructure and social security network. In 2005 and 2006, I was the first Western analyst to draw strategic conclusions from this trend, the steepest decline in fertility in the history of the world. Iran must break out and establish a Shiite zone of power, or it will break down. 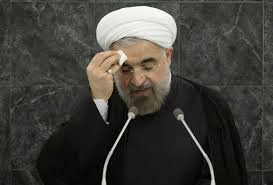 Rouhani -- there is a good reason he is not all smiles. Iran's theocracy displays the same apocalyptic panic about its demographic future that Hitler expressed about the supposed decline of the so-called Aryan race. Unlike Hitler, whose racial paranoia ran wild, Iran's presentiment of national death is well founded on the facts. That is not to understate Iran's paranoia. In 2013 Iran's Vice President alleged that Jews ran the international drug trade. In a June 2013 Facebook post earlier this year Iran's Supreme Leader Ayatollah Khameini wrote, "U.S. President is being elected [sic] only from two parties while Zionist regime is controlling everything from behind the scenes." That captions a cartoon showing fat men with moneybags for heads under a Star of David. Iranian officials routinely threaten to "annihilate the Zionist regime." The difference, to be sure, is that Germany's decline was by no means inevitable in 1938, while Iran's decline cannot be reversed. Iran's leaders know this quite well. Its universities have competent demographers who helped frame the first studies of Iran's fertility decline, and its leaders have inveighed for years against the failure of Iranian women to bear children. Persian-language website warn of the tidal wave of elderly dependents who will swamp Iran's economy. For all the public anguish the situation gets worse by the year. Nicholas Eberstadt of the American Enterprise Institute is doing the definitive work on this. Why should Iran's fertility decline so drastically? In my 2011 book How Civilizations Die (and How Islam is Dying, Too) I observed that Muslim countries jump from infancy to senescence without passing through adulthood. Wherever Muslim countries have wrenched their people out of traditional society into the modern world, a demographic transition has ensued, compressing the slow decline of fertility of the West during the past two centuries into a couple of decades. Literacy (and female literacy in particular) is the best predictor of fertility in Muslim countries: the best educated among them, namely Tunisia, Algeria, and Turkey also have fallen below replacement fertility. Iran's fertility fell the fastest in part because the deposed Shah set in motion a crash literacy program. Hitler only hallucinated the exhaustion of a mythical Aryan race: Iran's leaders live with the certainty that their civilization has barely a generation left before it collapses. Even a modest increase in fertility from present levels would do nothing to avert the coming train wreck, and the problem is getting worse by the year. What is the "national interest" of a dying country? In the case of Hungary, for example, with a Magyar fertility rate of less than 0.9, it is to ease the transition into oblivion by selling the country to foreigners and turning its capital into a theme park for tourists. 1,100 years ago the Magyars were feared conquerors who threatened the fragile recovery of newly-Christianized Europe; today they are a relic. Iran is not so ready to go gentle into that demographic night, however. It lashes out against enemies real and imagined, and the enemies it imagines in its worst nightmares are the Jews. Why the Iranians, and why the Jews? Jew-hatred is rampant in the Muslim world, to be sure, but that did not prevent Egypt and Jordan from keeping the peace with Israel for thirty years. Nor does it prevent Saudi Arabia, where Arabic editions of the "Protocols of the Elders of Zion" line bookstore shelves, from making a tactical alliance with Israel. Except for Iran no Muslim regime trumpets its intention to "annihilate the Zionist" regime in routine utterances. Iran has no common border with Israel. No Iranian soldier has killed an Israeli soldier in combat since the founding of the Jewish State. Yet hatred and fear of the Jews is a palpable presence in the minds of Iran's rulers. Some days the mullahs make the Nazis look rational by comparison. I cited a lecture given by an advisor to Iran's culture minister insisting that the cartoon "Tom and Jerry" was part of a plot by Jewish studio executives in Hollywood to rehabilitate the image of Jews. Iran's theocrats hate and fear the Jews for the same reason that Hitler did. The "Master Race" delusion of the Nazis twisted the Chosenness of Israel into a doctrine of racial election; for the "Master Race" to be secure in its dominion, the original "paragon and exemplar of a nation" (Rosenzweig) had to be exterminated. Islam is by construction a supercessionist religion. It claims that the Jewish and Christian Scriptures perverted the original prophecy of Islam, and that Mohammed restored the true religion through the Koran. Mohammed is the "seal of the prophets," the final and definitive exponent of God's word, replacing the falsified version of Christians and Jews. Muslims may believe this and peaceably await the day when its competitor religions will crumble and the whole world will acknowledge its prophet, just as Jews pray thrice daily for the Messianic era when all the world will acknowledge one God by one name. But it is difficult for Iran to be patient when its self-conceived guardians of God's message are staring into an inescapable abyss at the horizon of a single generation. This is a culture inherently incapable of reflection on its own deficiencies, one that has nourished itself for 1,200 years on morbid rancor against the Sunni Muslim majority and more recently against the West. Patience in this case is a poison. Israel thus faces a new Hitler and the threat of a new Holocaust. There is no way to portray the situation in a less alarming light. That is one parallel to 1938; another is the response of the world's powers to the emergence of this monster. As Franz Rosenzweig observed, once the Gentile nations embraced Christianity, they abandoned their ancient fatalism regarding the inevitable extinction of their tribe. It is the God of Israel who first offers ­eternal life to humankind, and Christianity extended Israel's promise to all. But the nations that adhered to Christendom as tribes rather than as individuals never forswore their love for their own ethnicity. On the ­contrary, they longed for eternal life in their own ­Gentile skin rather than in the Kingdom of God promised by Jesus Christ. After Christianity taught them the election of Israel, the Gentiles coveted election for themselves and desired their own people to be the chosen people. That set ethnocentric nationalism in conflict both with the Jews—the descendents of Abraham in the flesh—and with the Church, which holds itself to be the new People of God. As Rosenzweig put it, "Precisely through Christianity the idea of Election has gone out amongst the individual nations, and along with it a concomitant claim upon eternity. It is not that the case that such a claim upon eternity conditioned the entire life of these peoples; one hardly can speak of this. The idea of Election, upon which such a claim [upon eternity] uniquely can be based, becomes conscious for the peoples only in certain exalted moments, and in any case is more of a festive costume than their workaday dress. . . . Still, there sleeps upon the foundation of one's love for one's own people the presentiment that someday in the distant future it no longer will be, and this gives this love a sweetly painful gravity." The European elite cannot distinguish its own past parody of Israel's election from the self-understanding of the Jewish people as a blessing to all nations by virtue of its unique national life. Israeli nationalism only brings to mind Europe's failed nationalisms and their horrendous denouement in the world wars of the past century. Europe is enervated, exhausted by past wars, aging, hedonistic and cynical. It is not surprising that the nations of Europe once again would avert their eyes to the threat of another Holocaust. He deeply identifies with the fragile, unraveling cultures of the Third World against the depredations of the globalizing Metropole. So, I suspect, does his mentor and chief advisor, the Iranian-born Valerie Jarrett, and most of his inner circle. This goes beyond the famous declaration of Jimmy Carter's advisor Hamilton Jordan—"the Palestinians are the n****ers o the Middle East"—and Carter's own mainline-Protestant reverence for the "holy men" of Iran's 1979 Iranian revolution. It goes beyond the post-colonial theory of liberal academia. For Obama, it is matter of personal experience. His father and stepfather were Third World Muslims, his mother was an anthropologist who dedicated her life to protecting the traditional culture of Indonesia against the scourge of globalization, and four years of his childhood were spent at an Indonesian school. The same point has been made by Dinesh d'Souza, among others. Obama's commitment to rapprochement with Iran arises from deep personal identification with the supposed victims of imperialism. That is incongruous, to be sure. Persia spent most of his history as one of the nastier imperial powers, and its present rulers are no less ambitious in their pursuit of a pocket empire in the Shi'ite world. The roots of his policy transcend rationality. Israel can present all the evidence in the world of Iran's plans to build nuclear weapons and delivery systems, and the Iranians can cut the Geneva accord into confetti. Obama will remain unmoved. His heart, like his late mother's, beats for the putatively oppressed peoples of the so-called Third World. No factor of this sort was present in 1938: Neville Chamberlain did not sympathize with Hitler. He simply feared him and needed time to rearm, as the Wall Street Journal's Mr Stephens observes. If Lord Halifax rather than Chamberlain had been Prime Minister then, the parallel to Obama would be stronger. I do not know how Israel will respond. There are too many unknowns in the shifting political equation of the Middle East to solve that equation. But the facts on the ground support the Israeli view that the Geneva accord puts the Jewish State at existential risk.